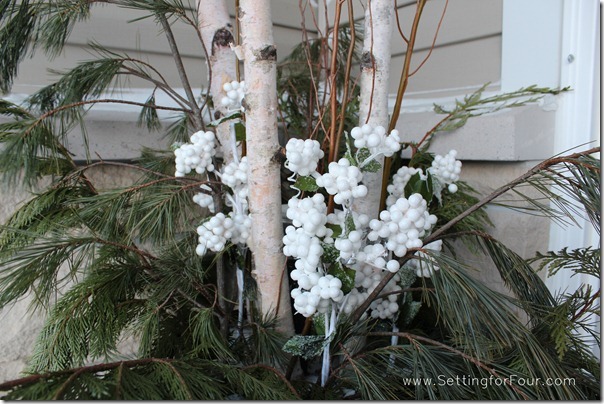 Learn How to MAKE a beautiful DIY Winter Wreath! 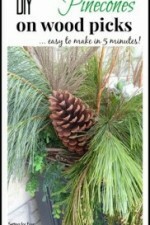 See this easy winter wreath tutorial and the supply list. This rustic twiggy wreath features a framed winter printable and DIY fluffy white yarn snowflakes to add a cozy touch to your front door! 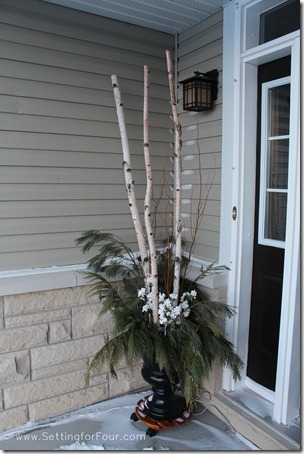 Here is my Winter Entryway with urns filled with pine and birch and my DIY winter wreath! Here’s a close up picture of the fluffy DIY Chunky Yarn Snowflakes that I added! 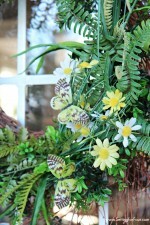 Supplies to Make a Twiggy Winter Wreath – Click on the links below to see more about each item! 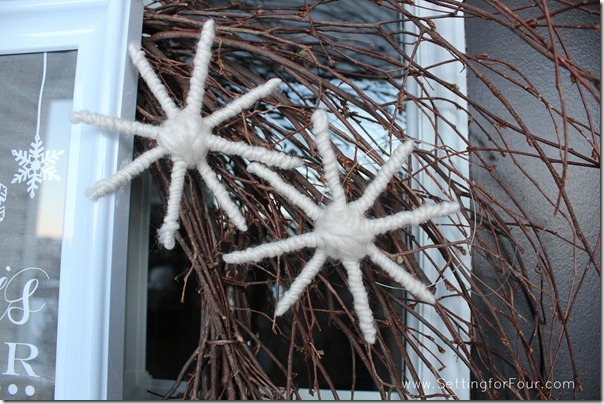 Secure DIY Chunky Yarn Snowflakes onto wreath with nylon fishing line. I added mine at 3 off center points on the wreath. Frame the chalkboard printable. Thread white ribbon through the back clip of the frame and secure to the hook on the door. 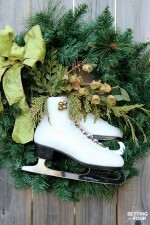 Let the frame sit on the front of the wreath. Want to see more of my entryway? Here is my front entryway at night! Isn’t it pretty! 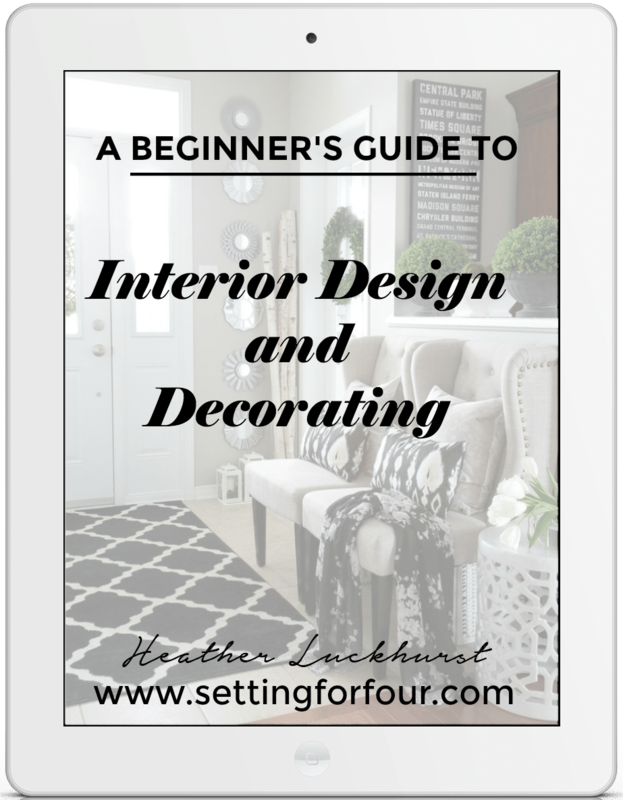 Entryway Resource list! Click on the links below to shop the look! 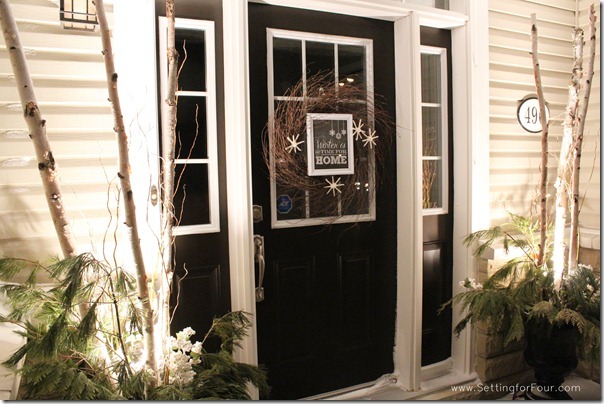 I placed white spot lights in the urns to give our entryway a pretty glow at night! 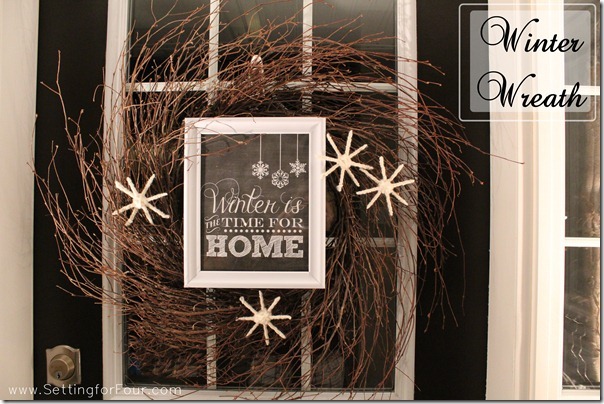 I hope you liked my Cozy Winter Wreath Tutorial with Framed Printable and Yarn Snowflakes! Oo! I love that little saying too! So lovely! I’m jealous of your Winter wonderland! It’s been very wintery-wonderlandish here the past month Courtenay! 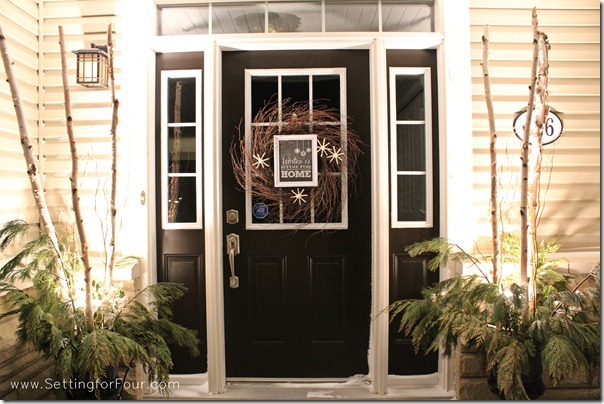 What a gorgeous wintery entryway … love the wreath and those yarn snowflakes! 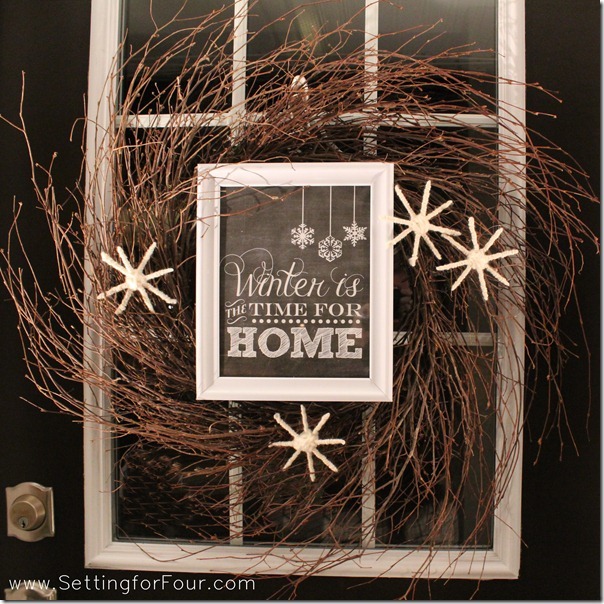 That printable is beautiful, and it’s just perfect with your pretty twig wreath! 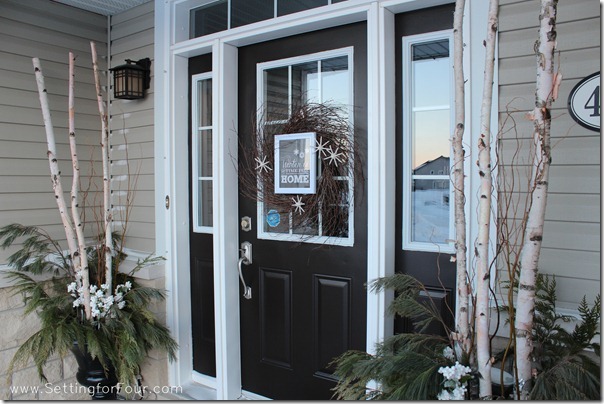 Your porch is so inviting, I am never good at winter and just skipped right to valentine’s day on our front door haha! Valentine’s Day is fun to decorate for too Jacque!! Thanks for your sweet comments Ann! I LOVE, LOVE, LOVE that wreath! The entire front porch is awesome! Thanks so much Katie!! I’m having fun decorating my porch for the seasons! I love your wreath and I really like what you put in your urns. I’ve been wanting to do something very similar. You’ve inspired me! Have a great week. 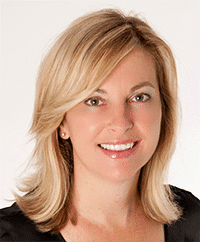 Aw – welcome Leslie! Have fun with your urns!! What a welcoming entry way. So beautifully decorated. The wreath is the perfect addition. Thanks so much Amy!!! Appreciate that! 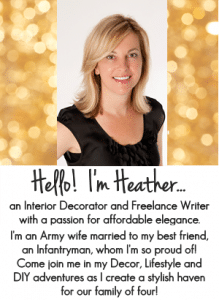 That is so beautiful Heather – just love it – you’re so creative!!! 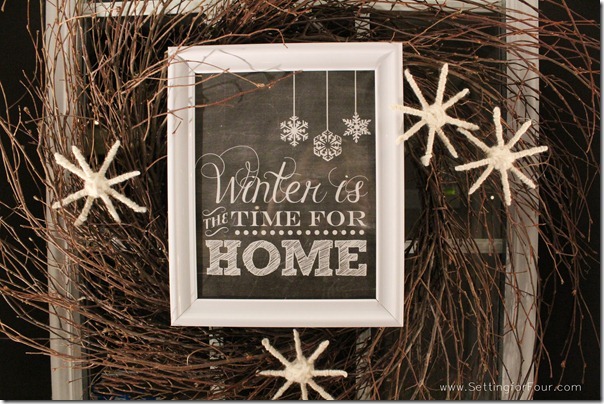 The wreath is gorgeous and I love the winter sentiment on the chalkboard. The entryway is so warm and inviting. Just lovely. Thanks for sharing.